Almost Friday, woohoo! And I’m trying to find motivation to run when my weather widget is reading 101 degrees currently. I’m all for toughing it out, but that may be beyond my threshold. I dunno, the air-conditioned elliptical may be calling me instead. Today was another insanely busy day at work and a bit annoying since they decided to over-compensate for the heat with air conditioning, I actually started getting chilled sitting at my desk. Anyway I got a new protein powder flavor today. 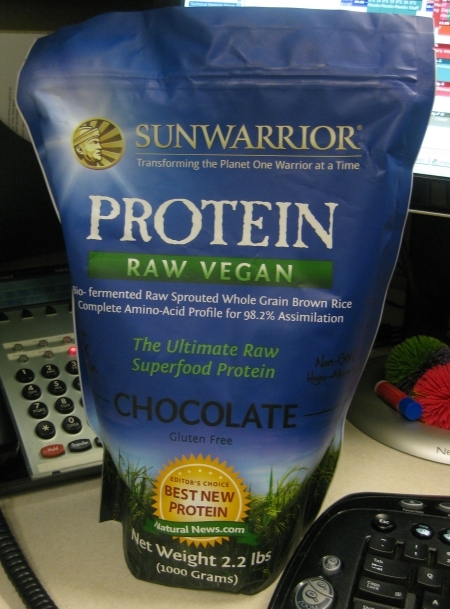 SunWarrior Chocolate Protein powder and great timing because hubby has discovered the vanilla in our pantry for breakfast smoothies, so between the two of us we’re killing the bag fast! Looking forward to trying the chocolate in smoothies and banana soft serve. I received another something new to try in my smoothies today as well. 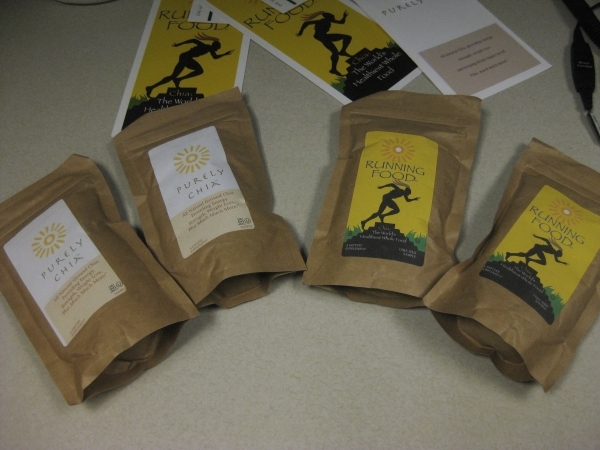 Running Food samples! 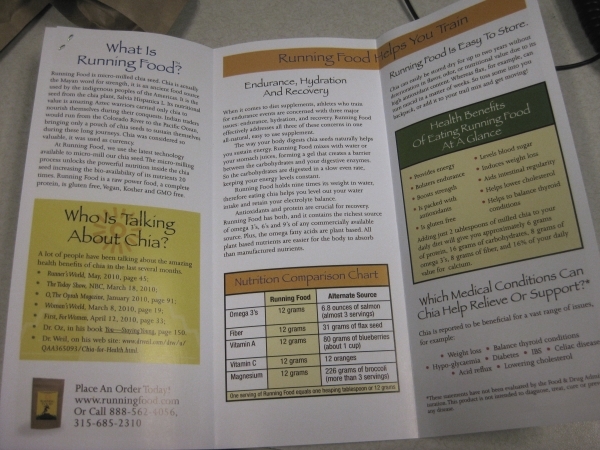 The Running Food is powdered black chia seeds for smoothies, cereals, salads and maybe some creative dehydrator cracker recipes too, hmmmmm… The Purely Chia packet is ground white chia seeds also for smoothies, salads, cereal and maybe banana soft serve. Anyway, the powdered seeds are in convenient small packets perfect for traveling, there seems to be enough in each packet for 5-10 servings. The texture is a fine powder, so blending into smoothies would be much quicker and you could simply mix the powder into fresh veggie juice when, gasp, you don’t have access to a blender and, again, making this perfect for traveling. This is something I’ll want to pack when on the road for destination marathons. My green monsters will be packed with goodness for the next few weeks! For lunch I was on a shopping mission to Sur La Table which happens to be near Whole Foods. 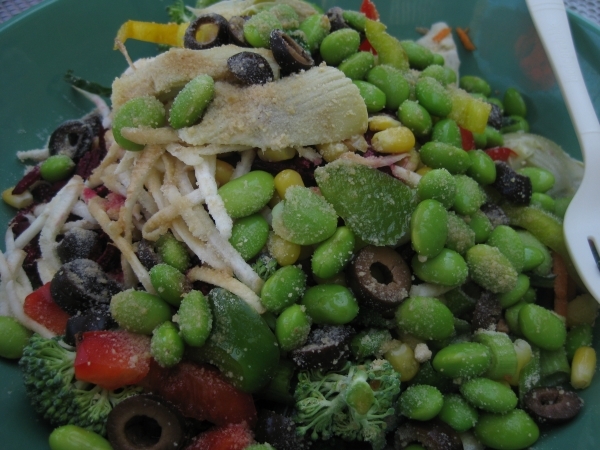 Edamame, parsnip shreds, broccoli, peppers, kale, olives, corn, green onions and carrots topped with Braggs Liquid Aminos and vegan parm alternative topping at the salad bar. Perfect fresh and crisp lunch for this dauntingly hot day. I find I crave less dehydrated and dry foods in this dry heat, I need moisture in my food! 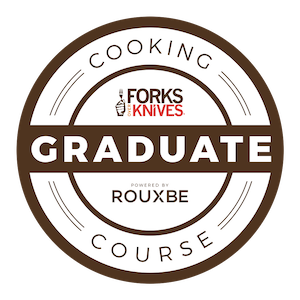 The I picked up another kitchen add. 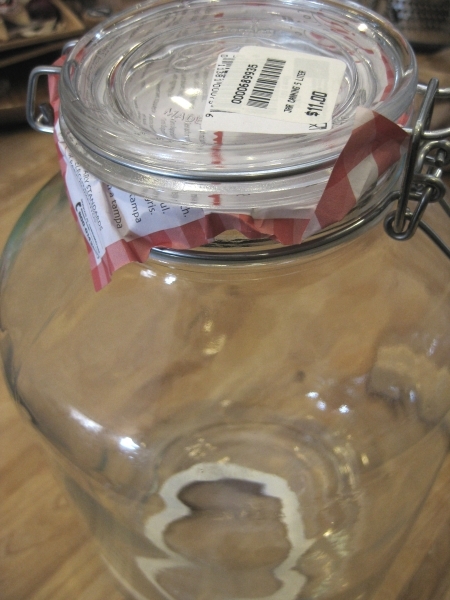 A 5 liter glass jar for making batches of kombucha and Ani Phyo’s Kefir starting hopefully this weekend – should be fun! 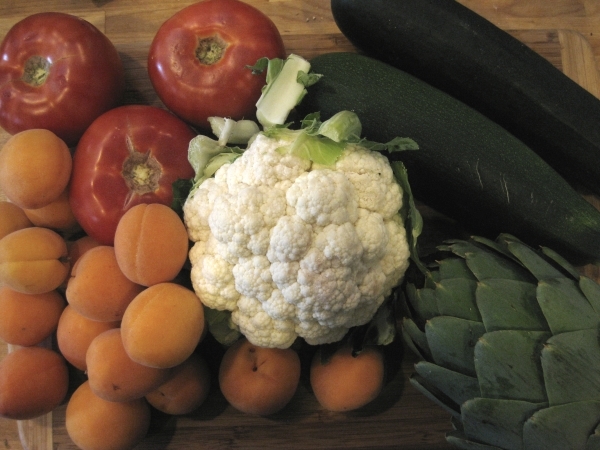 After work I trotted over to the local farmer’s market braving our sweltering heat for some sweet finds. A monstrously huge artichoke bigger than the cauliflower head, two huge zucchinis perfect for spiral slicing, huge tomatoes and plenty of fresh apricots for breakfast smoothies. 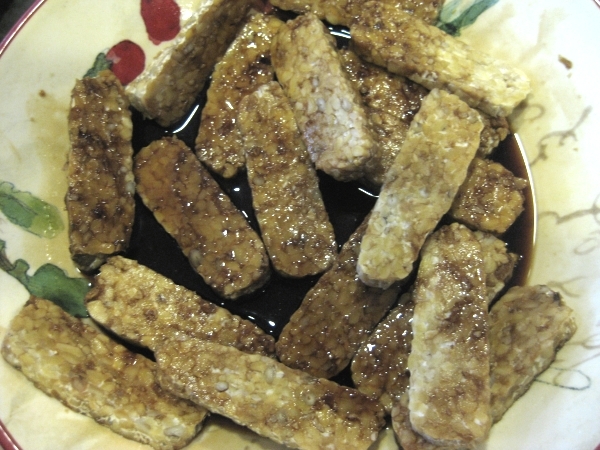 Then I got to work on a ginger tempeh stir-fry for dinner marinating the tempeh slices in nama shoyu (unpasteurized soy sauce) for about 20 minutes first this time. Then used the rest of the marinade to create a stir fry sauce in the Vita-Mix with toasted sesame oil, carrots, ginger and garlic. The end result was tasty, but very filling with all the veggies! ahh so jealous of your protein powder collection! I’m making Kombucha this weekend as well. I can’t enough stir-fries at the moment! I think because they’re quick and easy and I don’t need to put the oven on :) I keep on using white rice though since Tom prefers it but I’m craving some millet and quinoa. i love the choc sun warrior, it’s the shizzle girl! you will LOVE it! it’s way better than the vanilla IMO. I mean ‘nilla is fine for making other stuff but choc will stand on it’s own. i have this recipe for overnight chocolate brownie protein oats that I adore with my sun warr choc. It’s just oats, banana, agave, stevia, choc sun warr. Let it sit in fridge for 12 hrs..so good. Anyway i dont want dehyd foods at all when it’s hot…only when it’s cold and wintery out! Ani’s kefir, have fun! Ok just so you know, NO METAL can touch kefir grains or kombucha mushrooms. It messes w/ the bacteria mojo so just make sure the clasp on your jar that’s metal doesnt actually touch the mixture and youre good to go! can’t wait to hear about your progress! and no metal utensils to stir, plastic only. Or wood i guess. Just pointing this out in case you didnt know so you get optimal results! Can’t wait to hear what you think about those powders– they look good! I’m also wanting to try Sun Warrior– I always hear such good things about it! 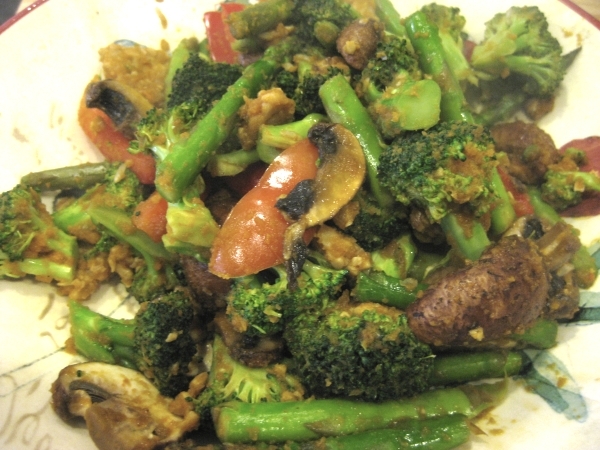 I love the idea of having tempeh in a stir fry, I must do that!!! I would definitely take the air conditioned elliptical over that heat!!!! You would be a crazy woman to do that! Let us know what you decided to do!! I haven’t seen those packets of chia seeds before. I usually buy mine in the bulk bin at whole foods. Hope you have a nice weekend, we have 90 + in Chicago this weekend! 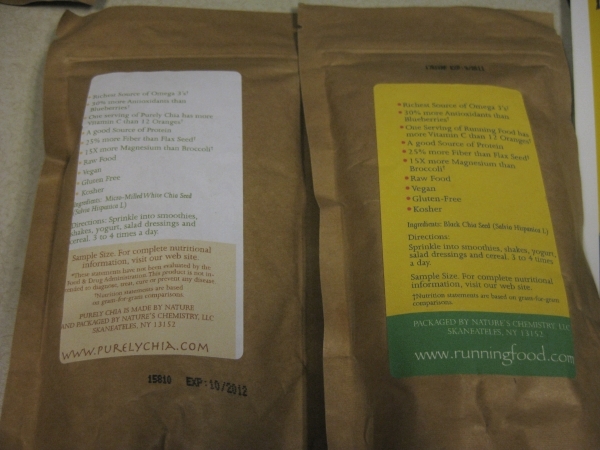 I’ll be really curious to hear what you think of those chia powders! Ani has a kefir recipe?? I must look through my book…I’ve always wanted to make my own! And Sun Warrior needs to start selling their protein in stores (please)!